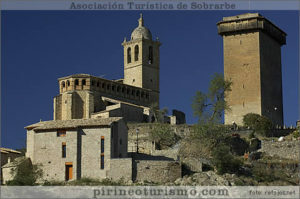 Sobrarbe is well known for the variety of its architectural heritage. Romanesque art is rife all over the region and can be seen in the buildings erected around the time of the birth of the kingdom of Aragon. Although from a range of ages and style, most of it was built in the Lombard construction style, so frequent in this part of the Pyrenees. The whole of the Old Town has been declared an Art-historic site. Examples of Romanesque style are the 16th century collegiate church of Santa María, the 13th century upper and lower gateways, the 12th century Hospice arch, and the remains of the 13th century church of San Salvador. It was built high up at a strategic point and was documented in the 11th century as “muro maiore” up to 1134 when it was donated to the canons community at Roda de Isabena by king Ramiro the 2nd. Access is along the road leading off the N260 between Ainsa-Campo. Guided visits in summer. 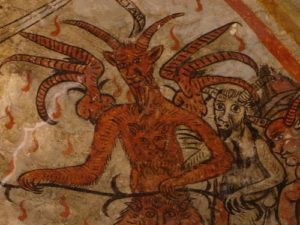 The church is a monument of Cultural Interest and consists of a magnificent Romanesque building that houses a coloristic collection of frescos dating from 1599. 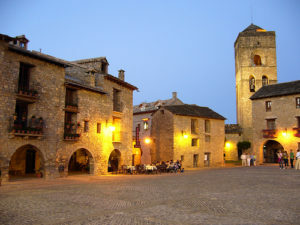 Other villages with striking examples of Romanesque buildings are Charo, Fosado, Tierrantona, Rañin or Palo. Access from a turn off on the road from Ainsa to Arcusa. Visits all year round. 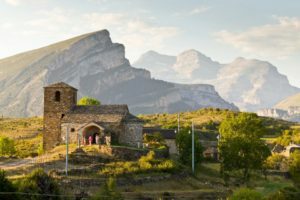 The church of San Martín (a National Monument since 1977), sitting up on its remote high plain, is one of Aragon’s oldest and most significant examples of Romanesque architecture. Access is from a turn off on the A-138. The Chapel’s footpath starts from Tella and the circuit takes about an hour on foot. 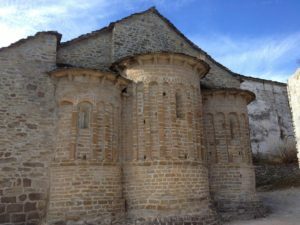 The chapel of Saints Paul and John is one of the earliest Romanesque examples in Aragon. It was consecrated in 1019 by Bishop Borrel of Roda de Isábena. Access along a road from the A-138 at Labuerda. Guided visits all summer. Up on a prominent hill some 500 mts from Labuerda and declared a monument of Cultural Interest, sits the Romaneque church of San Vicente. It houses a magnificent painted alter panel and its entrance is covered by a lych gate near the church. Access is from the road that branches off the A-138 between Ainsa and Barbastro. Visits all year round. The Abizanda watch tower is a rectangular Romanesque fortress with a turret on each of its sides. Access to the castle is from the village square. Visits possible all year round. 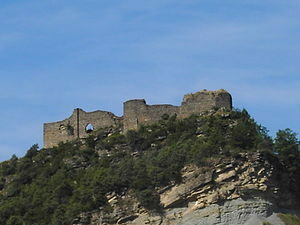 Up on a ridge to the north of the village sit the ruins of a Romanesque castle built in the time of Sancho el Mayor. 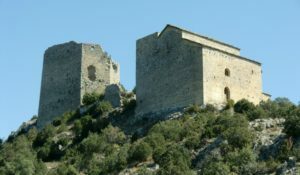 The castles at Boltaña and Abizanda are the only ones with complete outer walls and decorative characteristics in common like at Loarre, these being the first Christian forts in Sobrarbe. 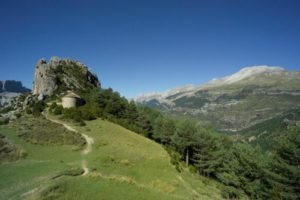 Sadly the castle at Boltaña fell into early decline around the middle of the 12th century, followed by some reforms between the 12th-14th centuries before finally being abandoned during the 17th and 18th centuries. Direct access from the A138. Accessible all year round. 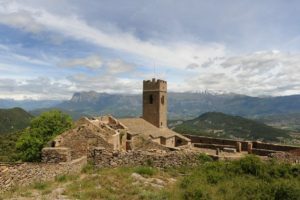 The church and castle of Samitier or Castle of Monclús sits on a prominent peak between the Mediano and El Grado reservoirs. Access is from the A-138 at Escalona and from theN-260 at Sarvisé. Accessible all year round. 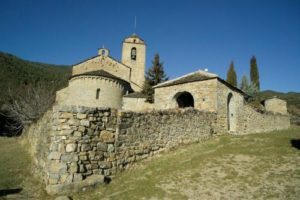 The most interesting Romanesque building here is the church of San Vicente in Vió, at the southern entrance to the valley on the outskirts of the village. This small building dates from the 12th century and consists of just one nave with its semi-circular apse. To the north sits the church of San Martin on the old track down to the River Bellós. A pretty Hamlet with a beautiful parish church that has the most striking lych gate in the region. 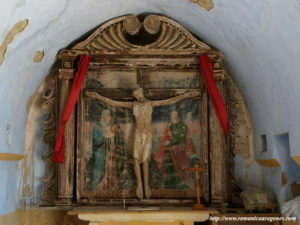 The chapel of San Mamés is an hour’s walk away (ask for the key in the village) and has stunning views as well as a Romanesque figure of Christ carved out of a single piece; the 11th to 12th century Sobrarbe Christ.